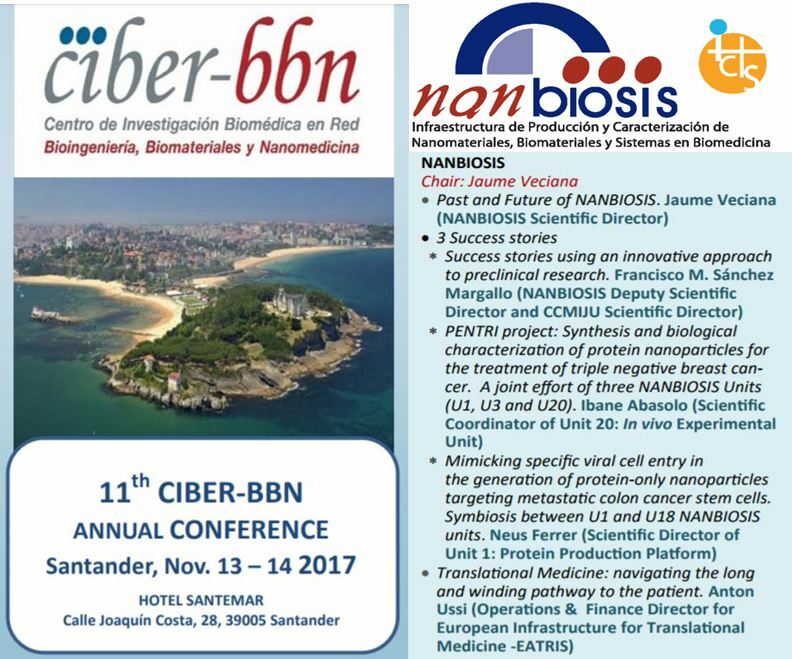 You are here : Home / Posts Tagged "CIBER-BBN"
Scientists from two NANBIOSIS units participate in two of the three projects selected in the Call CIBER-BBN / CIBERONC. 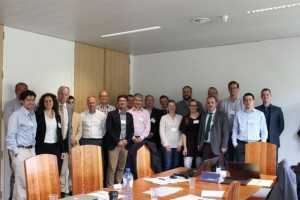 On April 13, the 1st CIBERONC – CIBER-BBN Collaborative Projects Forum took place at the National School of Health (Carlos III Health Institute). The purpose of the event was to carry out the resolution of the call for collaborative seed projects between the two areas. During the forum, 12 proposals for collaborative projects were presented, encompassed in four thematic sessions: new nano-devices, new strategies for 3D culture, phototherapy and drug release. All the proposals included the application of some of the latest innovations in the fields of bioengineering, biomaterials and nanomedicine to try to respond to a clinical oncological need. Josep Samitier, Scientific Director of NANBIOSIS Unit 7 , together with Rosa Noguera of CIBERONC, coordinates the project “3D models in vitro for the studies of mechanotherapy in neuroblastoma“. This project addresses a very novel topic of undoubted scientific interest: the effect of the physical properties that the extracellular matrix contributes to the progression and treatment of tumors. In addition, the project has a high translational value and could be applicable not only to neuroblastoma but to other types of tumors and the general metastatic process. The CIBER-BBN organizes in Barcelona a WORKSHOP related to the European project H2020 “IPMT-Integrated Precision Medicine Technologies Center of Excellence”, framed within the program “Spreading Excellence and Widening Participation”, in which the scientific direction and scientific committee of the CIBER -BBN, together with the Fraunhofer Institute of Biomedical Engineering (IBMT), participate as reference advisory centers of the University of Cyprus (UCY) and clinical institutions of the country, coordinators of the proposal. Day 1: IMB-CNM, Campus UAB, Bellaterra, Barcelona, Meeting Room, Jose Millán. Day 2: Hotel Silken Sant Gervasi, Barcelona, Room Garden. The CIBER-BBN currently has 47 research groups, selected on the basis of their scientific excellence, working mainly within three scientific programs: 1. Bioengineering and Medical Imaging, 2. Advanced Biomaterials and Therapies and 3. Nanomedicine. The activities of the center is oriented both to the development of prevention, diagnosis and monitoring systems and to the development of technologies related to specific therapies such as regenerative medicine and nanotherapies. 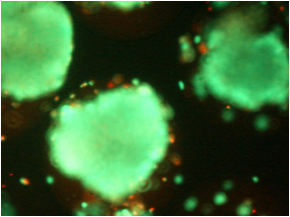 The Group of Nanotechnology and Apoptosis (NAP) focuses its research on the development of general methodologies for the functionalization of nanoparticles and surfaces always looking for biotechnological applications. Jesús Martínez de la Fuente is the author of about 150 articles in scientific journals of the highest level and inventor of 6 international patents, all licensed. He is an associate member of the Center for Cell Engineering of the University of Glasgow and of the Institute of Applied Sciences and Intelligent Systems of the Italian CNR in Naples and professor at the National Center for Translational Medicine (Shanghai Jiao Tong University, China). He is also co-founder and scientific advisor of the company NANOIMMUNOTECH S.L. The Photonics Engineering Group focuses its work on fiber optic sensor systems and instrumentation. Prof. López-Higuera is a Fellow of the OSA, USA; Fellow of SPIE, USA, and member of the Royal Academy of Medicine of Cantabria. He is the Director of the International School of Light Sciences and Technologies that develops the fourth week of June of each year to the highest scientific and technological level in the world. He has made more than 600 academic and 17 industrial publications (patents). He has co-founded three technology-based companies. 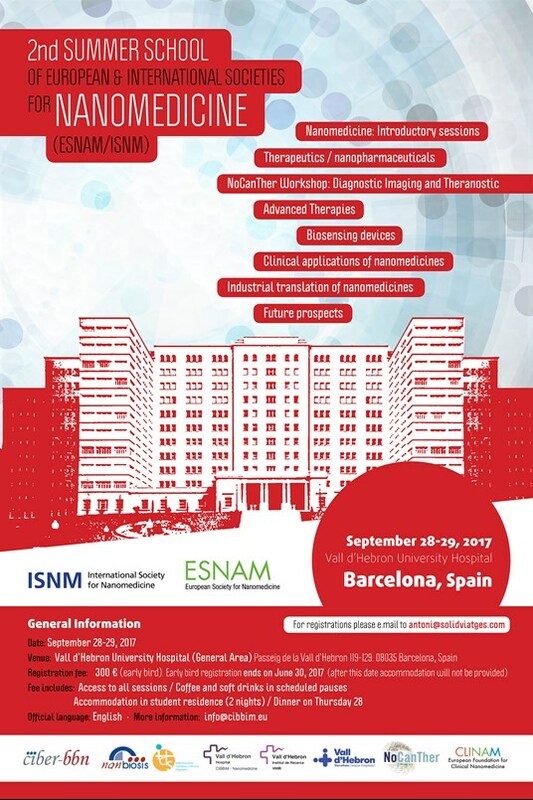 Next November 8, 2016 will be held at the Residence for Researchers of CSIC in Barcelona a meeting between researchers from NANBIOSIS Units and other CIBER-BBN researchers with researchers from the University of Torino. 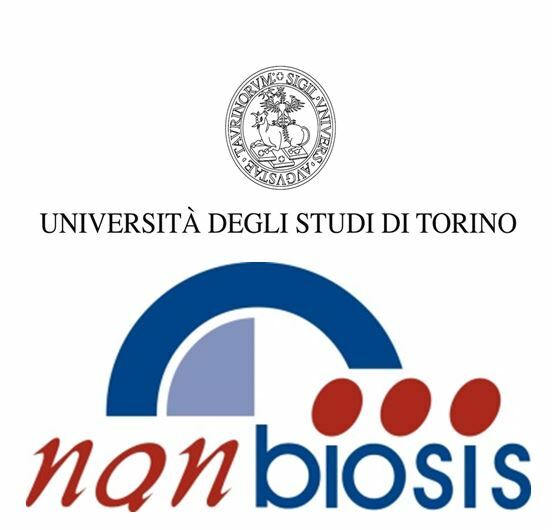 This event is organized by NANBIOSIS and partially funded by the Ministry of Economy and Competitiveness through PRONANBIOSIS SAF2015-69388-REDI Project for ICTS. The event consists of a series of presentations by the assistant research groups and B2B partnership, with more than 60 pre-arranged individual meetings and the possibility of organising new meetings after listening the presentations. The final object is to interact to seek collaborations and promoting joint projects.